Since I'll have to wait 2-3 weeks for my Nexus7 to arrive (if it gets delivered on schedule), I've been trying to get some more details by browsing more of the reviews. 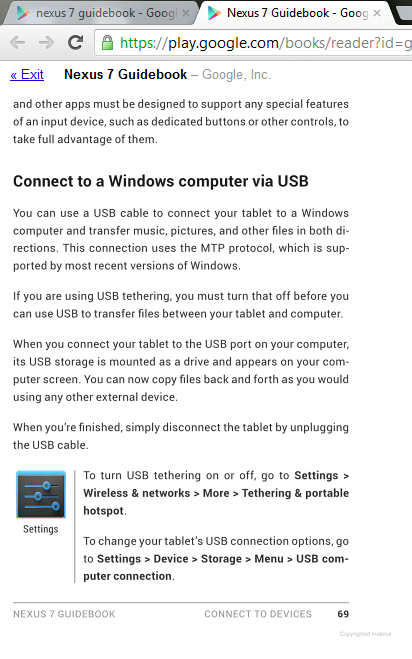 It appears that the mini-USB port doesn't support 'OTG', which I *think* means that while I could connect a USB mouse or keyboard to the Nexus, a USB stick or USB HDD won't work? This might mean that when I have offline content (eg. pdf files previously downloaded and stored on my PC, USB stick or HDD) that I want to move onto the Nexus I'll have to first upload it to the 'cloud' (eg. via my Google Drive folder on my desktop that is synced with my online Drive storage) and then download it onto the Nexus, or else download it straight onto the Nexus from the original source website. Aside from this upload/download cycle being slower than simply transferring files through the USB port, it would also mean using up some of my monthly WiFi internet bandwidth allowance! That's probably not an issue (unless I want to transfer lots of photos or home video files), as I currently use about half of my 6GB bandwidth allowance most months. 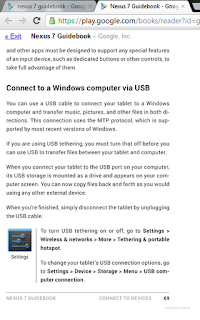 But it would be a lot more convenient to be able to just connect a USB stick to the Nexus. I don't know enough to work out if the WiFi connectivity can be used to access files via my Windows home network, or just connect to the WiFi modem at home and WiFi hotspots outside (eg. at the library). So I've sent a query to the Google Play helpdesk about this - hopefully they provide good customer service for device queries. I've since found the Nexus 7 Guidebook in the Google Play store. After several unsucessful attempts to 'buy' this free book (and getting a 'technical error' message each time) I realised from some of the reviewer comments that the book is only viewable using Chrome, which explains why I couldn't 'buy' the book using IE9 (although I had no problem placing my order for the Nexus 7 tablet using IE). So I downloaded and installed Chrome for Windows and then had no problem getting the Guidebook! MIssed my Nexus7 Delivery. D'Oh!